The year is 2154 and humanity has built a mining outpost on the planet Xenon III. Profits have been down for the Xenon Mining Company (XMC) for decades, forcing them to cut corners, defer maintenance, and ignore required firmware upgrades to their ageing AI mining robots. An electrical storm has enveloped the planet and XMC’s command center has taken a direct hit. The current surge has shorted out the coupling between the robots and the master servers, allowing the automaton units to move freely about the planet. The robots have taken control over all systems on the outpost and the humans must defend themselves. The Mines of Xenon layout depicts the early days after the ‘bot revolt and the workers’ counter-uprising in which the miners must secure a base, scrounge for supplies, and fight for survival. The humans have managed to commandeer the existing freight and passenger rail systems as their only way to ensure safe passage around – and under – the planet surface until either they arrange to escape in a freight launch-craft or help arrives. One of the greatest benefits I get from reading print model railroading magazines or books is the power they have to spark my imagination. I will often read an article again and again, poring over every detail of the photographs to fuel my dreams. The earliest modeling memory I have from my teens is when I first discovered Model Railroader magazine and found the article “A Lunar Railroad You Can Model” in April of 1978. By checking the date you’ll know that it was meant to be tongue in cheek, but the lead photo of rail cars on the lunar landscape stayed with me, if though dormant, until adulthood. Recently I was inspired by watching an outer space themed movie and went back to that old photo. A new project was born: The Mines of Xenon layout. It has now been 40 years since I first saw that magazine article. Until that moment, I had been a by-the-rules model builder. I have a small industrial switching layout that stays pretty much true to script (explore this blog for a lot more information on the Southside Industrial District). It is my first layout as an adult and has given me the chance to hone my modeling skills and learn updated techniques that I learned as boy. But now it was time to branch out. The trains run through a fantasy environment of robots, spaceships, and dinosaurs. As the trains run, a world unfolds around them. 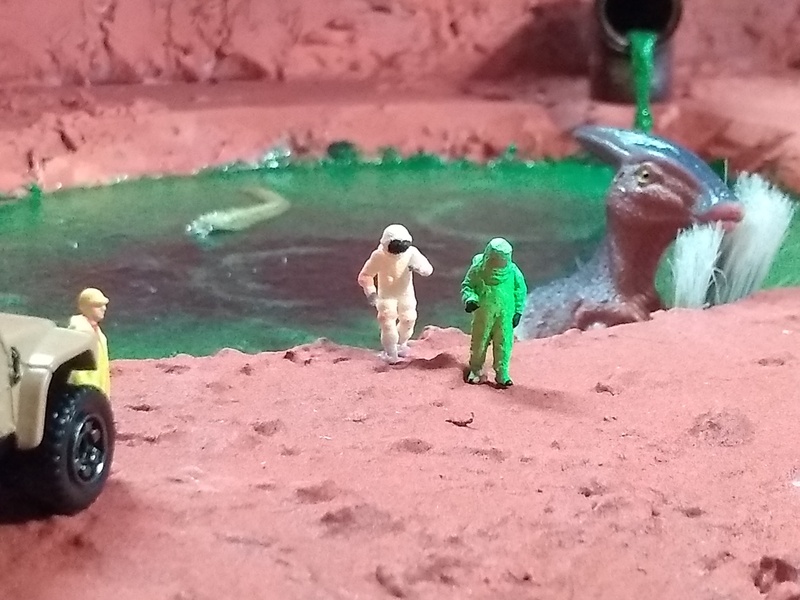 Radioactive sludge fills the extract pond as rogue robots attempt to take over the planet. Humans have retreated in defense, planning their next move. I wanted a place for imagination to have the freedom to run. I wanted people to feel welcome to operate or touch the layout (within reason). It should be created from relatively cheap and available materials and provide low entry barriers for new and young modelers. It should be simple and include interactive possibilities (like some of the old Tyco electric accessories). Basically, a glorified Christmas morning train set. I had become frustrated with the lack of a continuous-run possibility on my industrial switching layout so I knew I wanted a loop. If this was to be on exhibition, I wanted to be able to let trains run of their own accord, freeing me up speak to visitors at a show or guests in my home. Initial sketch of the Mines of Xenon track plan. Notice the point-to-point passenger line as well as the ore dump spur in the upper right corner, both of which were abandoned in the final design. I would also take this chance to introduce my youngest daughter to model railroading and she would help me out with design decisions and age appropriate tasks. So then it was off to the Internet to get inspired. I started mixing standard model railroading search terms with words like “science fiction”, “fantasy”, “futuristic”. What I found was amazing. I found a whole other world of hobbyists, especially in the gaming community. I would encourage you to check out the war gamers and their creativity. There are some amazing modelers out there that have nothing to do with model railroading. I wanted to learn from them and incorporate as many cross-genre techniques as I could into my model making. In my searching for futuristic railroad items, I came across the Turbo Train set that Tyco sold in the 70’s. This would fit the bill perfectly and I picked up a used box set for a nice price on eBay. I settled on a mining theme on a foreign planet. The mines would add some operational possibilities, the use of heavy industrial machinery (and robots), and the chance to incorporate a passenger line to move workers around. I knew Tyco also offered an operating ore dump car and set, so I would be able to work that into the plan. The genre would be science fiction with a bit of a nod to post-apocalyptica a la Mad Max style. Other genres you might consider for your own railroad are fantasy, Gothic, Viking, steampunk, or even a mix of different genres. I didn’t want the apocalypse to be too dark, so I went easy along that dimension. 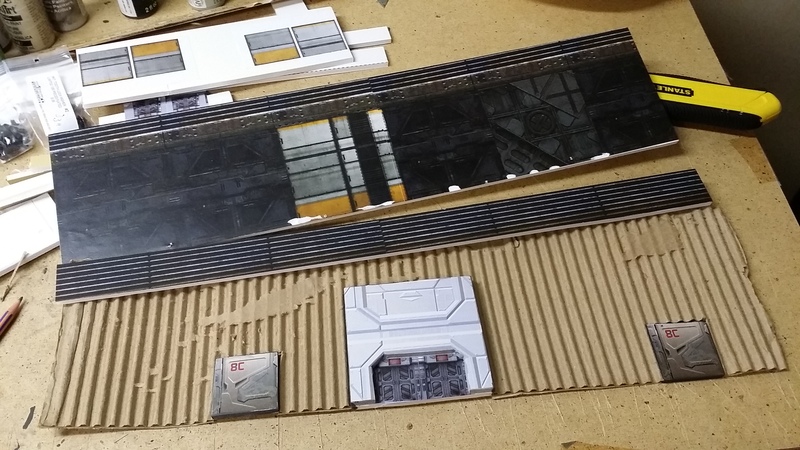 I wanted to test out some ideas and modelling techniques before committing them to the layout, so I built a 2×4′ diorama. 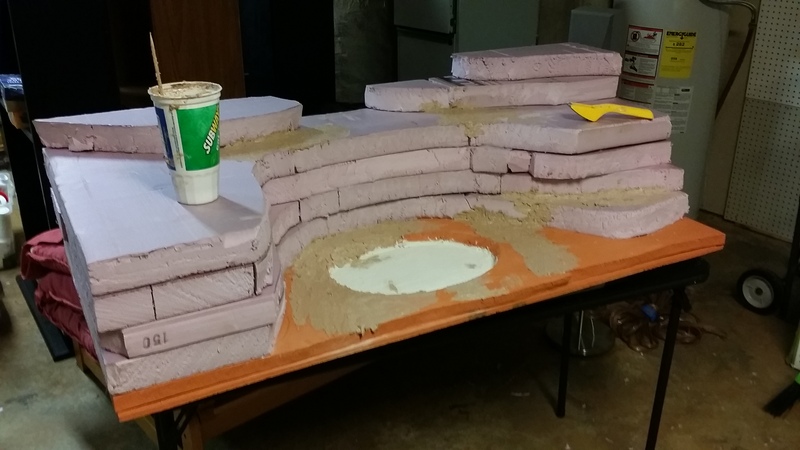 I had never worked with extruded foam (for the mountain) or resin (for the sludge pond) so I wanted a place I could try my hand and practice. I tried out combinations of colors that I think turned out OK. I also wanted to test out size and spacing. One side of the diorama is the sludge pond, the other is the underground passenger terminal. After a couple of attempts, I settled on a technique for the pond. I found that leaving the foam cut and not smoothed like a mountain made it appear more as a quary (or mine) might look. Using different combinations of pieces gave me the look and feel I was going after for an underground station. The diorama also gives me an setting or background for photography. I can quickly add pieces or move them around for the affect I am going for. I decided early on it was best to keep it simple. Every time I was tempted to add a siding, turnout, or crossing, I resisted and pulled back to what is basically a loop with a passing siding. The Turbo Train must run on steel track (it is held down by magnets), so it ended up being a separate outer loop. I added a couple of spurs to the freight line so I could 1) dump the ore with the Tyco accessory and 2) have another destination and holding siding for processed material headed for the freight space shuttle. This photo shows early progress of the layout with most track in place. The mine and processing plant will be on a mountain at the far end and cover the three loops of track. The Turbo Train passenger line is independent of the freight line and painted white. The terrain includes a mountain to add visual interest and provide a destination for mine trains. One end of the freight tunnel is the xenon mine and the other end houses the processing facility. This orientation allows me to use the old empties in / loads out operating scheme I first learned about from Model Railroaders N scale Clinchfield Railroad. For passenger operations, there are two stations modeled of a shuttle line. One station is at the mine and the other at the dormitory for the workers. The simple loop allows me to turn on trains and let them run while leaving me free to speak or explain the layout. I can add some basic switching to break up the monotony. The turbo train is really fun to run and can be run by youngsters for an interactive experience. A big red button on the side of the layout invites you to push it and dump the processed ore for shipping. I’ve also added some battling robots for another aspect of interaction. Plans also include a crashed spaceship with lights and smoke, as well as an operating turret to protect the mine with lasers and sound. A radio active sludge pond with runoff creek adds visual interest, while the setting allows a lot of freedom for inserting a cast of unique characters and vignettes. Construction is mostly by the book, despite the topic being modeled. Extruded foam over an open grid of 1×4’s make up the benchwork. The mountain is more 2″ extruded foam stacked. The only thing I did different here was to not smooth down the edges, but rather keep the edges “cut”, much like a quarry on the planet Xenon might look. The sludge pond is resin with several coats of Mod Podge to give texture on the surface. Track is mainly a mix of brass Tyco train set and Atlas snap track, as are turnouts. I invested in a few new #4 turnouts because that is where reliability issues show up first. The Turbo Train track is steel Tyco track painted white to set it apart and give it a familiar, yet different, look. Beyond the basics, details were made with what I could find on hand. Two plastic soda bottles make the bridge tunnel for the Turbo Train. Ballast is construction sand painted with the same color as my base terrain. Rolling stock is Athearn Blue Box PS hoppers modified for the outer space mining environment. I’ll cut the three bays into individual units and place on a single truck. Some modified train set flat cars will be used for hauling heavy equipment and maintenance of way purposes. At the moment most couplers are NMRA horn-hook style for robust operation by little hands. Upgrading to Kadee style may be an option. Motive power consists of custom kitbashed “space locos” (see article “Kitbash A Deep Space Model Locomotive”). There will be at least one for a mine train and one for freight ops. The head unit of the Turbo Train comes out of the box unmodified. It is basically a slot car motor on a chassis with plastic wheels of the correct HO gauge. The engine and wagons are very light and held down to steel track with magnets. This design is quite effective and the train can travel vertical and even upside down, though I have chosen not to exploit that at this time. Basic operation involves continuous running of the mine train in a loop. There will be two mine trains so I can operate an empties / loads operating scheme using the passing siding within the mountain. Automatic operation can be interrupted for picking up, setting out, or dropping a load of processed Xenon ore with the Tyco ore dump accessory. The Turbo Train operates independently in a loop and can be run by young observers. Other interactive pieces include the battling spider robots, a gun turret on the mountain, and possibly lasers on a crashed spaceship. I’ve come this far in just a few months which is fast for me. I still have the mine cars to build, locos to finish kitbashing, mountains and toxic waste pools to model, all the while stretching my imagination on how to use those dollar store robots. Then I must decide if I take the layout on the road for shows. If you happen to see me out there, be sure to come by and say “hi”! You just might find yourself saving the human race from an onslaught of killer robots – or at least have fun trying! 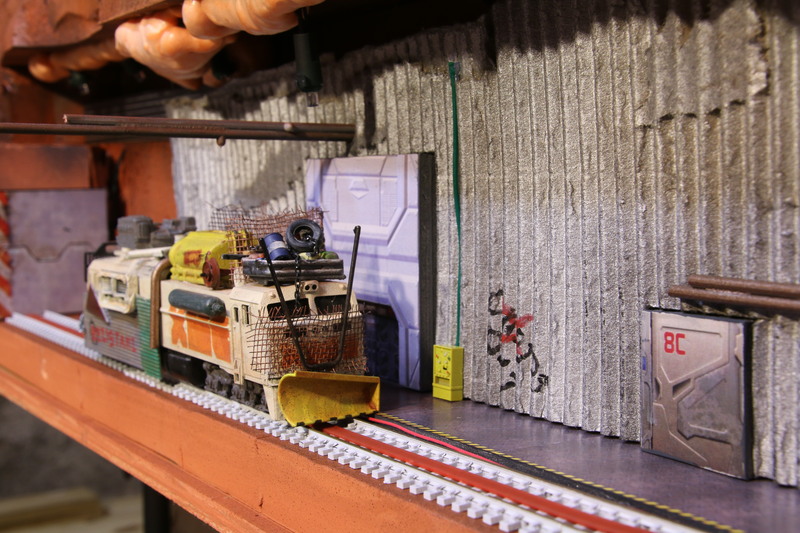 Fun and play is the name of the game on The Mines of Xenon science fiction model railroad!